These days, it’s quite common to stumble upon articles that make you doubt their veracity, and at first glance, this one would probably fall into that category. However, we can assure you that the facts reported here are correct, and that getting a subcutaneous microchip implanted for work is already happening in certain countries. The concept comes under the term biohacking—the improvement of the human body’s abilities using technology—and Welcome to the Jungle investigated further in order to understand if the practice really has a future, and if it does, will we all, one day, be buying our meals or opening doors using something that looks like a metallic grain of rice inserted under our skin? The first patents relating to radio-frequency identification (RFID) technology were filed in the 1950s. Originally created for military use, devices associated with this technology allow the memorization and remote transmission of data using an antenna and a microchip. Today, thanks to extreme miniaturization, they have invaded our daily lives: They’re in credit cards, anti-theft tags, ID badges, passports, and even our pets. There are two types of chips: Active RFIDs and passive RFIDs. The former are equipped with their own battery, which allows them to transmit information over long distances, and memory, which gives them better storage capacities. When you open your garage door with your remote control, an active RFID transmits waves to identify itself to the opening system, which then activates. The principle of smaller, passive RFIDs is simpler: Each chip contains a unique ID and occasionally additional data that is read when placed near a transmitter/receiver—also known as an RFID reader or interrogator. These interrogators read the information written on the chip and trigger a specific action. This is what happens when you withdraw money from an ATM or use your ID badge to open a door. The number of volunteer employers having passive chips implanted between a thumb and forefinger at the request of their employers has been increasing every year. The operation is quick and painless—a syringe is used to inject a small glass vial under the skin, and bingo—you are now a cyborg! RFID chips started to become easily accessible at the beginning of the millennium, but their implantation within the human body began in the 2010s in countries where they’re widely used, such as the United States or Sweden. In 2017, the Belgian company NewFusion made quite a buzz by implanting RFID chips in eight willing employees. In 2017, Dangerous Things, an American company that specializes in biohacking, sold fewer than 10,000 implant kits globally–a number they say is still too low for the practice to be considered a real trend. Amal Graafstra, the founder of the company, has not one but two implants! He believes subcutaneous chips will be accepted by the general population one day, comparing it to the acceptance of the pacemaker, which was considered the “devil’s work” when it became fully implantable in the late 1950s. In France, for instance, most specialist RFID companies have made the decision not to begin manufacturing implants for one simple reason: It is still considered too gimmicky. Currently, the type of chips that are placed in humans are all passive. The operation would be much more painful if you needed to insert an active one, which would be the size of a normal cigarette lighter because of the battery it requires. The advantage of passive chips is that they do not emit waves. Remember, we are talking about the same technology that is in your subway pass, which you have to take out of your wallet half of the time for it to even function. It is therefore impossible to localize or even track this type of chip. In addition, the memory capacity of subcutaneous microchips is limited. To give you an idea, the passive RFIDs readily available on the market today only allow for data storage of 500 characters on average. This is the volume of data needed to program the chip to open doors, unlock a computer, pay at the cafeteria, or even print documents—but this means that they also contain personal data that can be stolen without you being aware of it happening. A hacker equipped with a good reading system would just need to swipe over the implant to gather the information on the chip. This poses not only a risk for individuals—albeit at a time when a large part of our data is already accessible via the internet—but also for businesses, who only make their security more vulnerable by adding additional channels of information. 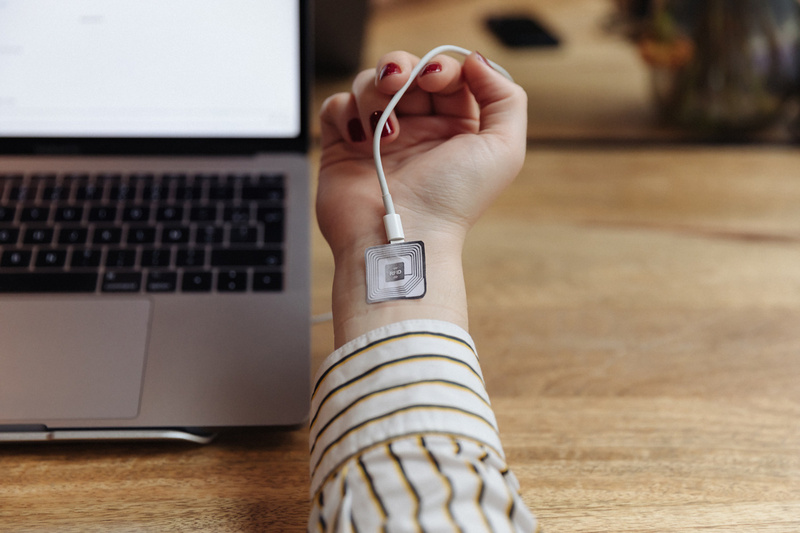 Equipping employees with implanted RFIDs is a way to provide them with innovative technology in their daily lives, but if this also potentially represents another way to hack into sensitive company information, is it really worth it? For it to really make a difference, an electronic chip needs to centralize a lot of sensitive data, and centralized information leads to more substantial security issues than if this information were divided across various media, such as flash drives, ID badges, paper, and so forth. Are miniature active RFIDs on their way? Remember, it has only been possible to miniaturize passive RFIDs enough to be implanted because they do not need batteries—it is another story altogether for active RFIDs. Equipped with batteries and sensors, the device is capable of transmitting constantly and therefore geolocalizing an individual or collecting data in real time. Currently, these systems work through connected objects. Nevertheless, the scientific community has not given the final word and is working on developing technologies that would see batteries being recharged via movement of the human body. If a person can serve as the energy source for their chip, active RFIDs will have broken through an additional barrier to miniaturization, and that means implantation. This is an encouraging prospect for some people. Imagine if a chip could alert diabetics via their phones when they need to take their insulin and advise the correct dosage. This is a highly anticipated revolution for healthcare, and chips could make life easier for millions of people and simplify the most complex medical diagnoses. But the downsides are worrying: Being able to track people’s geographic position, as well as all of their data—with or without their consent—would be a major invasion of privacy, especially if they were unaware of it. According to expert opinion, implanting subcutaneous chips for work will remain voluntary, but the phenomenon should not be completely discounted. Maybe, one day, RFID chips will allow us to share secure information with a swipe of our hand or even control a screen from a distance. They will be more than just a gimmick then. They will be an out-and-out revolution, and we will probably come across more and more coworkers with a metal “grain of rice” between their thumb and forefinger.